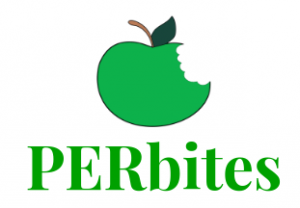 PERbites, covering physics education research. This is a guest post by Nick Young, a graduate student in physics at Michigan State University and the founder of PERbites. We’re excited to announce the launch of our new sister site to Astrobites, PERbites. At PERbites, we focus on issues related to physics education. While the term physics education suggests training people to teach physics the field is much broader than that. Physics education includes traditional education areas such as how students learn physics and what they don’t understand about physics. But physics education also includes access and equality issues, instructor development, understanding the culture of physics, and general STEM issues such as increasing enrollment. So why should you care about physics education research? Many of the studies in physics education fit into the broader conversation about science education and promoting students (especially women and underrepresented minorities) to study a STEM field. In addition, many universities group physics and astronomy into a single department, meaning issues related to the physics community are just as relevant to the astronomy community. Finally, science is driven by research and as physics education researchers, we believe decisions about how to teach physics and build a physics community should be as well. Check out our recent article about what introductory astronomy students think about the long-term fate of the universe. Spoiler alert, it’s probably not the same as what you think.